Restored to represent the Victorian Era in which it was built, this house was home to Mrs. Lilllie Stone, daughter of a pioneering family in Gahanna. 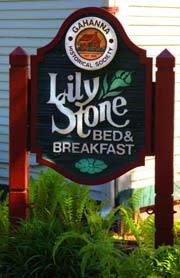 After acquiring the property in the 1980s the historical society now operates the charming Lily Stone Bed and Breakfast. This Victorian style bed and breakfast has four guest rooms. Enjoy all the attractions around downtown Olde Gahanna! Located across the street from The Log House and John Clark's house. Call (614) 476-1976 for reservations.